Acro is an exciting dance style that combines dance technique with gymnastics skills. Ballet is a traditional, technical style of dance known for its graceful, fluid movements. Contemporary is an expressive style that combines elements of other dance like ballet, jazz and modern. Hip Hop is a popular, street-style of dance that originated in 1970’s New York hip hop culture. Jazz features dynamic and stylized movements. It includes many variations, from traditional to contemporary. Our musical theatre classes bring out the performer in any dancer. 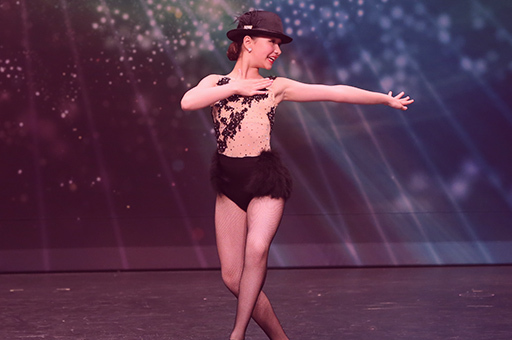 Learn Broadway-inspired choreography and characterization. Tap lets dancers make music with their feet. We start with simple sounds and progress to more complex rhythms. Classes for our youngest dancers focus on fun and fundamentals. Students learn about music, movement and rhythm. Acro is an exciting dance style that combines the technique and artistry of dance with flexibility, balance and tumbling skills of gymnastics. Beginner acrobats work on foundational skills such as handstands and cartwheels. As students develop flexibility, strength and master pre-requisite skills, we safely progress to more advanced skills such as scorpions, aerials, handsprings and layouts. Dancers learn to execute skills with control and artistry, seamlessly integrating the movements into choreography. Students in Acro Level 3 or higher must also take a weekly jazz class to complement their training. We also offer acrobatic dance camps during the summer. We recommend ballet for all dancers as it is the foundation of many dance styles. Ballet is known for its graceful movements and artistry. We teach the Royal Academy of Dance (R.A.D.) syllabus from pre-primary to advanced levels and recommend exams when students are ready. Between ages 2 ½ and 6, we offer Pre Dance beginner ballet classes. These classes focus on foundational skills such as marches, skips and musicality. For advanced dancers, we also offer pointe classes. Pointe requires many years of training and strong technique. Admission to our pointe classes is by invitation or assessment. Contemporary is an expressive style of dance that combines elements of other styles such as classical ballet, jazz and modern. In contemporary classes, students explore the connection between music and movement. This is a fluid, free-form style where shapes and levels punctuate choreography. Contemporary choreography can be abstract and unpredictable, and students are challenged to draw audiences into the choreography’s story by dancing with emotion and artistry. Students registered in contemporary are also encouraged to take ballet or jazz classes to complement their training. Hip hop dance is a popular street style that originated with the birth of hip hop culture in New York in the late ‘70’s. Many different styles of dance make up what is commonly called hip hop, including popping, locking and break dancing. Hip Hop is always evolving as new styles influence it, such as dancehall. Students in these classes are taught a variety of hip hop styles and learn to perform them with confidence. If your child likes to ‘floss’ or ‘dab’, this is the right class for them! We have classes for dancers of all ages and experience levels, including ‘all boys’ classes and adult classes. Jazz is a dynamic class that is great for beginners or as a complement to training in other styles such as acro, tap or musical theatre. Our jazz program teaches a variety of choreographic styles ranging from more traditional to contemporary variations. Students work across the floor learning jumps and turns. Our classes also focus on building strength, flexibility and control. Dancers apply the technical skills, along with signature jazz dance elements like isolations and syncopation, in choreographed combinations. Musical Theatre is a high energy dance class that is perfect for children who love to perform or who want to learn to perform with more confidence and personality. Students in our Broadway-inspired classes learn musical theatre dance technique and choreography. We also use fun games and exercises to teach characterization, acting and performance skills. For children interested in dancing, acting and singing, we also offer a “triple threat” program called T3. In the T3 program, students learn the dances, songs and script from a show and perform it. This program runs from November through March and this year’s production is Mamma Mia! Click here to learn more about the T3 program. Tap is a dynamic, energetic style that allows dancers to make music with their feet. Ask any child who has had a pair of tap shoes on and they’ll tell you how fun they are! Tap is a terrific way for dancers to develop coordination and musicality. Students start with basic steps like stamps, stomps and digs and before long they’re moving on to cramp rolls, paradiddles and drawbacks. At tap class, students are taught to execute skills with precision in order to deliver a clean, crisp sound that complements the choreography. 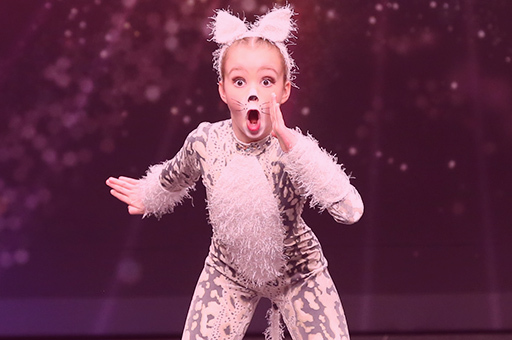 Children can start tap class as young as 5 years old. We also offer adult tap classes, which are a great workout for your body and your brain. Classes for our youngest dancers are focused on teaching dance basics in a fun, friendly and supportive environment. We introduce young dancers to music, movement and rhythm in age appropriate and engaging activities. For children 18 months to 30 months, we offer our Tiny Dancer class which is a great way to introduce your child to music and movement while listening and working together. 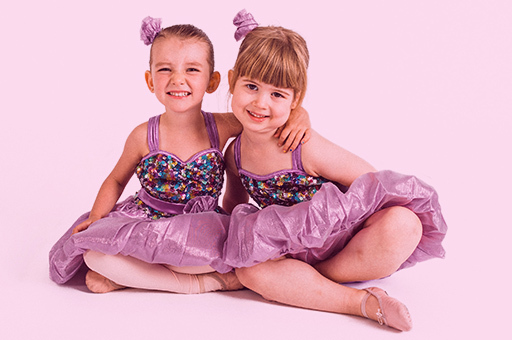 For children 2 ½ + we recommend our ballet based Pre Dance classes as a good starting point. We also offer Dance Explorer classes, which introduces several dance styles, and Itty Bitty Acro which introduces balance and flexibility skills. If necessary, parents of children in our Tiny Dancer class are welcome to sit in class with them. We also have plenty of monitors in our lobby so you can watch your child’s class.